Natural wordsmith or student of the language, having a comprehensive dictionary to fall back on can be indispensable. Granted, future generations might frown upon us for striving to become our most eloquent selves (all the while publishing Emoji to English dictionaries), however in the interim, why not uphold the tradition of cultivating our language? 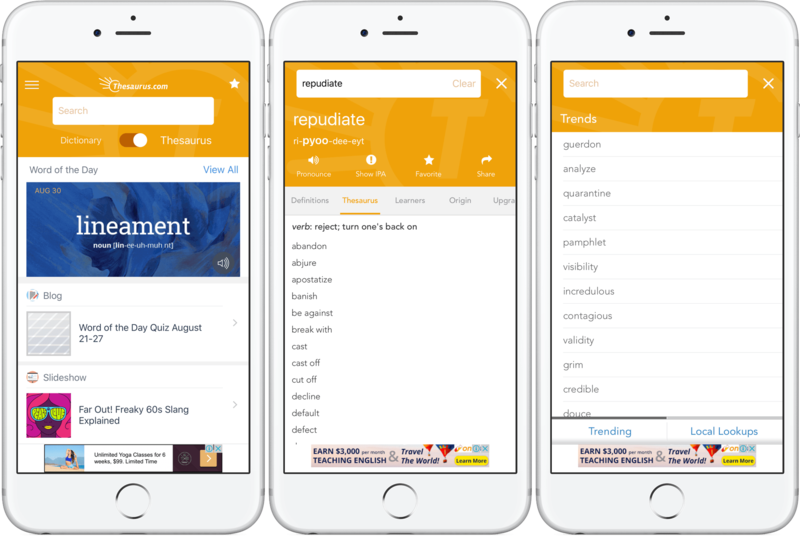 In this spirit, we have once again rifled through the App Store to showcase the best dictionary apps for iPhone and iPad available as of September 2017. According to their bookkeepers, Dictionary.com boasts over 2,000,000 trusted definitions and synonyms. 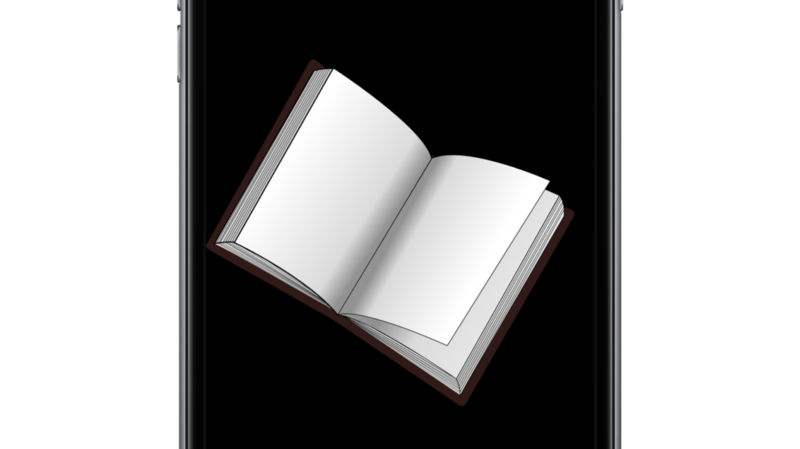 The free version comes with some minor cutbacks, such as no offline mode or the absence of a helpful idioms and phrases tab, however it is still a nimble thesaurus that is easy to navigate and use. Amongst other features, the most notable ones in my book are audio playback for pronunciation, a witty word of the day implementation, trends and a wildly entertaining ‘Local Lookups’ tab, starring words sought out in your city and their precise locations. 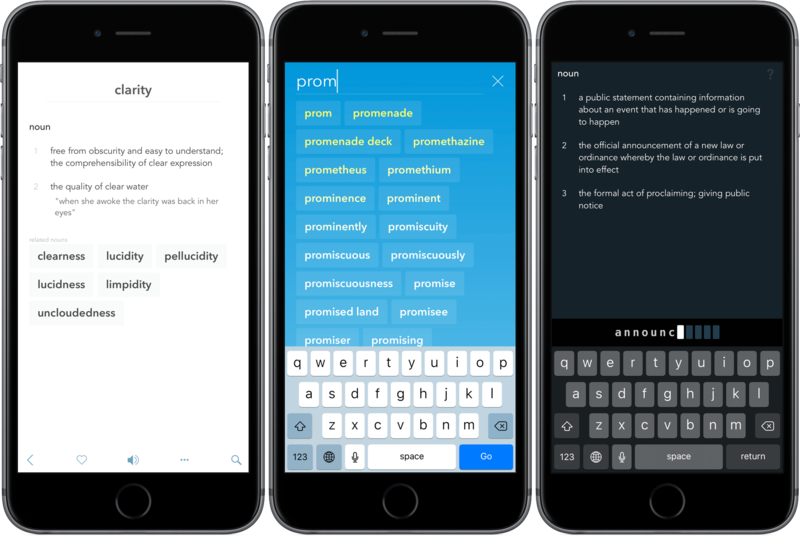 Incidentally, Dictionary.com also packs an above average Apple Watch app and iCloud syncing between all your devices. If you don’t use new words all of the time, you tend to forget them. As brutal as that sounds, it’s the unfortunate, harsh reality. 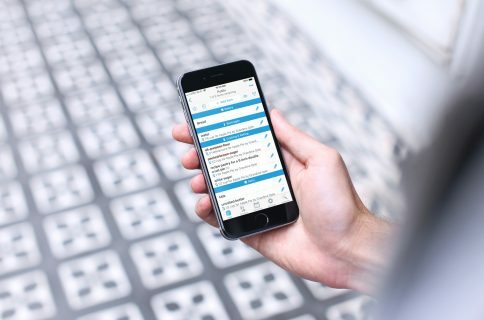 This app lets you lock those new words into a vault for your memory’s safe keeping. Look up new words and save them for later with the vocabulary review system. And even if you do forget the meaning of a word, the app’s beautifully implemented pop quiz will help you retain the information. Functionality aside, Word Vault is possibly the slickest of our winning apps with a flat, snappy interface that cannot be praised enough. Merriam-Webster’s unwieldy badge oozes tradition, as well it should be for an association claiming to be a household name since 1828. 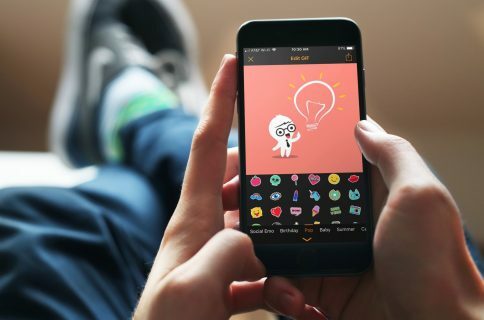 At 200,000 word choices and examples, the app is not necessarily the front runner in terms of sheer mass, however other features like vocabulary games, voice search, example sentences or audio pronunciation are dripping with quality. In addition, iCloud synchronization for your favorite words as well as an Apple Watch extension is provided. Today, the app can either be purchased outright for $4.99 or downloaded for free. The latter does not skimp on features but invariably means ads, which can be removed at $1.99 per year. English Thesaurus is a capable, 349,000 word strong dictionary also featuring a vocabulary register and flashcards component. For what it’s worth, the app feels compact and well-rounded, which is demonstrative of the fact that the dated revenue model of upfront payments still produces the most top of the line offers on the market. English Thesaurus awaits you on the other side of a $2.99 payment, which on all accounts is good value: aside from the mentioned flashcards feature, there is an array of settings to fine-tune your search results (such as filters for informal, colloquial, technical words), plenty of preferences to adjust the audio playback (including an offline speech option), different visual themes and much more. If you’re not religiously opposed to paying some coffee money on a potent word book, English Thesaurus will live up to your expectations. A popular business model amongst these apps, Dictionary. too has a premium offer valued at $3.99. Be that as it may, the free Dictionary. 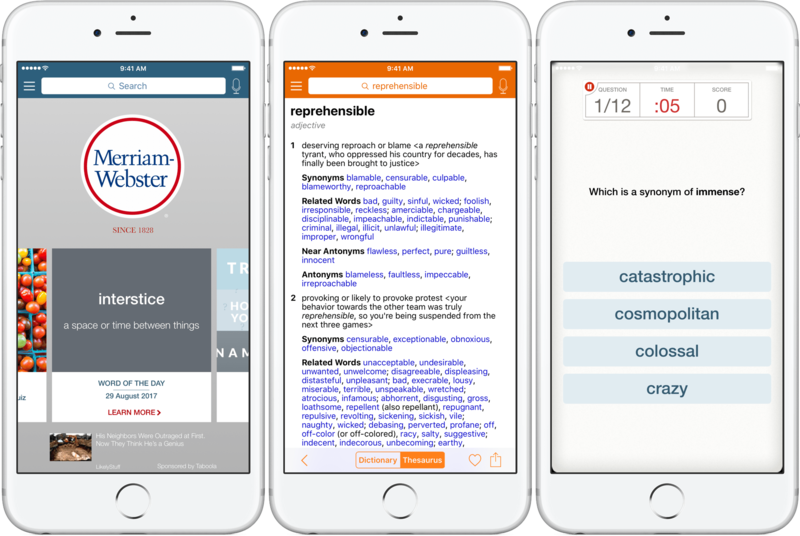 app is holding its own ground and is nothing to scoff at: the app draws its data from various dictionaries (including Webster’s Dictionary, Roget’s Thesaurus, The American Heritage Dictionary) at once, making for one of the most comprehensive databases condensed in an app for your pocket. 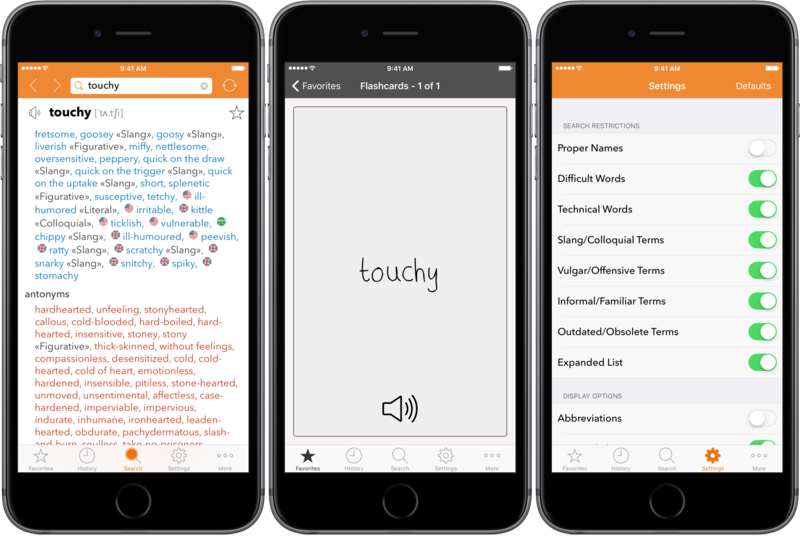 Next to synonyms and antonyms, other outstanding traits are free word games, a word and idiom of the day section, pronunciation and a free offline modus. What it lacks in presentation, it makes up for in content. In other words, this one is not necessarily a sight for sore eyes (especially if ads are not deactivated for $1.99), at the same time it’s arguably one of the richest in content. While less glittery, WordWeb Dictionary comes entirely free of charge and still boasts 285,000 words, phrases and derived forms. The somewhat more clinical look aside, smart search implementations such as spelling suggestions or fast pattern-matching search (where asterisks and other characters can be used to fill in for unknown vowels or consonants) give WordWeb Dictionary an edge over other generic dictionaries. The other good news: no internet connection is required to rifle through the app’s immense word catalogue. WordWeb Dictionary’s free offer does not support audio playback whereas a $3.99 variant does. 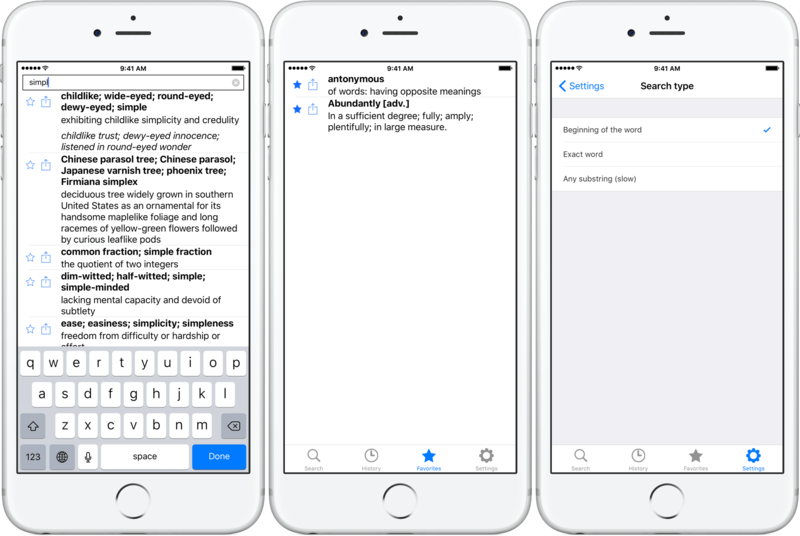 Last but not least, English Thesaurus & Synonyms Dictionary Offline (…exhale) comprises over 330,000 terms, words and definitions. It’s available at no charge, which needless to say brings about ad banners you will likely learn to live with. To purge the app from those, an in-app upgrade is available at $1.99. 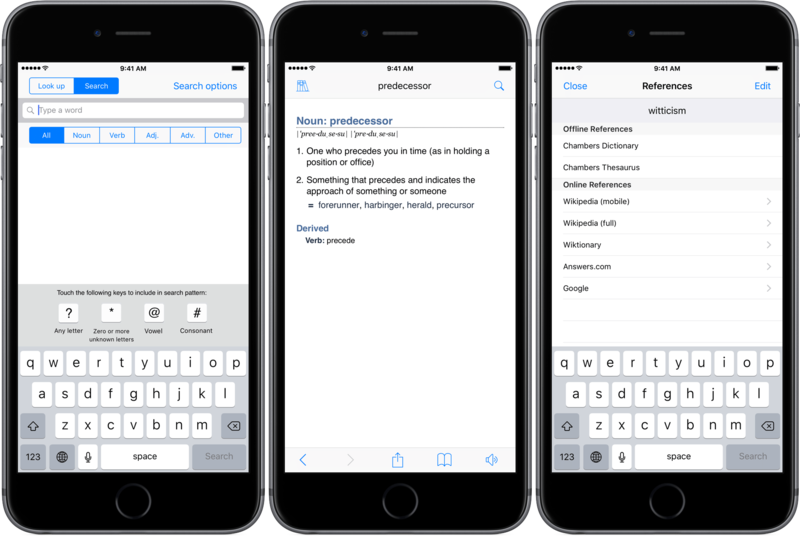 As far as features, the app includes two plain but useful tabs – History and Favorites – to navigate and backtrace your word search efficiently. There is something to be said for simplicity, a line this one is clearly taking. And that wraps it up for our collection of dictionary apps. Counter to custom, we aimed to provide you with as many quality offers as you can digest in one read and drop the runners-up spot entirely. 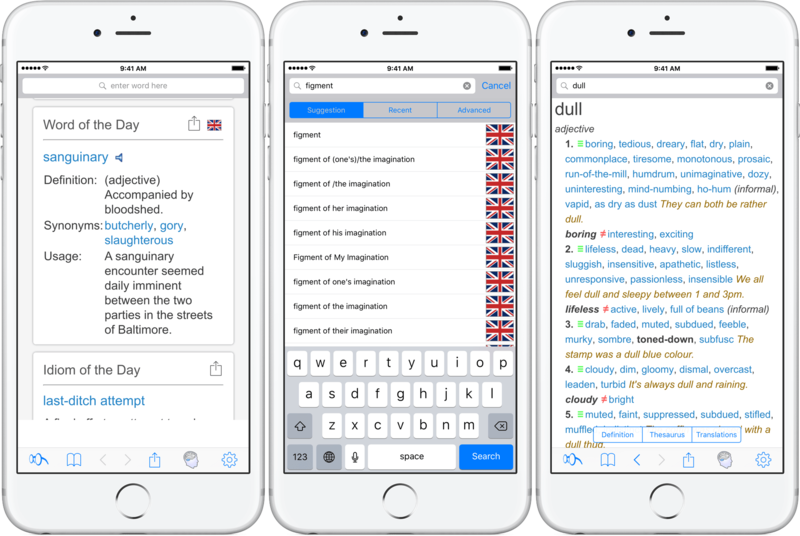 As there is an excess supply of dictionaries on the App Store, make sure you drop us a line in the comments if your app of choice has flown under the iDB radar!